Call to book your appointment!!! We are Lash Affair & NovaLash Certified! Award-winning, long-lasting, medical-grade lash extension adhesives have earned its reputation as “the healthiest” professional eyelash extension system. Comprised of a wide-ranage of textures and sizes of eyelash extensions that can be combined for looks that run from subtle and natural to trendy and glamorous; each lash application is a work of art with an intricate finish. Individual eyelash extensions are perfect if you are looking to feel instantly pretty! These lashes will give you longer, fuller lashes instantly. Each lash is meticulously applied lash-by-lash, with award winning medical-grade adhesives. Unlike “clusters” that some other lash extensions offer, NovaLash eyelashes are individual lashes, that are weightless. We consider these lash extensions an art! 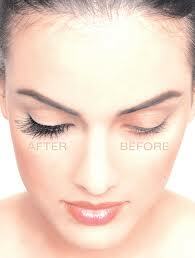 When properly applied, eyelash extensions can be worn throughout the year with minimal monthly maintenance. Touch-ups are recommended after the initial full set application to refill any lashes that have cycled out. To maintain the full, thick appearance of a new set of lashes a visit to your beauty/lash professional is recommended every 2 to 3 weeks based on your own natural lash growth cycle. Can eyelash extensions harm the natural lash? Once lashes are applied what is the proper way to care for the lashes? Using a lash wand to comb the lashes free of tangles is recommended. You shouldn’t leave a hair salon without top of the line hair products – same with your lashes! Don’t worry, we are here to advise you and carry all of the products you may need to care for your lashes. The extension sheds along witth your natural lash growth cycle. To maintain a full appearance it is recommended to get a fill anywhere from 2-4 weeks. How long will my lash appointment be? Application of a full set cormally requires up to 2 hours. Fills can range from 30 minutes to an hour. It isnt recommended. If mascara is used it should be a water based brand. It is very important to remove all makeup daily and wash thoroughly.